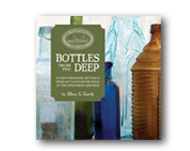 This small but gloriously illustrated softcover book presents the colorful examples from an amazing find of 19th-century bottles in a shipwreck in the deep Atlantic, 100 miles off the coast of Georgia. The bottles were en route to New Orleans in October 1865, just months after the end of the Civil War. They reveal a time capsule of bottled goods of the times - from popular herbal bitters (with their high alcoholic content) to quack medicines (Mrs. Winslow's Soothing Syrup for Children) to condiments, fruit preserves, hair tonics, writing inks, perfumes, beer and wine, and much more. The author is Curator of Collections for Odyssey Marine Exploration, the shipwreck recovery and marine archaeology company that discovered the wreck of the SS Republic in 2003. She lives in Tampa, Florida.